THIS IS OUR learning year. At least it is a year of learning opportunities. Whether we’re capable of actually learning remains to be seen. In January the debacle of Southeast Asia taught us, as I pointed out at the time in this space, that “In the special branch of ethics that is economics, any system built on the backs of the downtrodden will be forever unstable.” A couple of months ago I observed that Japan “is as successful a supply-side economy as the modern world has seen, and as such its difficulties should be a warning to the United States.” Today the object lesson is Russia, and what it teaches is that a sound government is the sine qua non of a sound economy. Please note that sound government comes before sound economy. To the extent that the Soviet Union was Marxist, things were the other way around before Communism’s collapse seven years ago. They are still the wrong way around in Russia’s brave new world of privatization, plunging rubles and other economic shock treatments. The form of government Lenin instituted, said to be a “dictatorship of the proletariat,” was certainly some kind of dictatorship. lts civil law concerned orders and commands, but not customs and contracts. So Mikhail S. Gorbachev and Boris N. Yeltsin found no legal system in place to regulate the revolution to a market economy. It should be noticed that the high-powered “reform” economic advisers from Harvard and MIT and the International Monetary Fund were not dismayed by the lack of a free-market legal system. They were all convinced that the vice of the Western world is excessive regulation, and that the former Soviet Union and its former Warsaw Pact allies would benefit from the shock treatment of being thrust to sink or swim in the turbulent waters of the new global economy. Although this might cause some suffering and even some inefficiency (which in standard economics is evidently more blameworthy than suffering), they contended that it would be better to get rid of the bad old ways at one fell swoop than to creep along incrementally. Once the market was freed and assets were privatized, the reformers promised, everything would efficiently fall into place. Of course, that is not what happened. In some respects Russia may be the American West all over again, but there are significant differences. Our “privatization” was better managed as a result of long experience with land settlement, and blatant corruption was at least reined in by posses of settlers eager and able to take the law in their own hands. Furthermore, our pioneers could maintain themselves by subsistence farming and small-scale mining; in Russia there is little to fall back on when large-scale privatization misfires. Most important, our banking and taxation systems grew with the country, whereas in Russia they are struggling to be transmogrified from Soviet systems utterly unsuited for their present purposes. Suppose for a moment that you live in Minsk and have gotten your hands on a factory that produces something used in Pinsk. Ten years ago a commissar periodically instructed you to send x amount of the stuff to Pinsk and gave good grades for fulfilling the quotas. The people in Pinsk accepted whatever they received. Well, you can see this is going to be a drawn-out affair and you may get nothing for your trouble. Moreover, you find that your bank and the Pinsk bank have no satisfactory clearinghouse arrangements (they’re working on them). Assuming you get the order, your payment will be slow and uncertain. In the meantime, it turns out that you already have staggering taxes to pay. A trip to the tax office enlightens you: The local bureaucrats have not been paid for months. But you are confidentially told the taxes can be taken care of with a few dollars or marks (and cautious winks tell you where to get hold of some) in the proper hands, plus several samples of what you manufacture. You resist with all your patriotic heart. Then you learn that the local big-time operators (known as “moguls”), whose Mercedes and dachas you have envied, have embraced this system (and it is, after all, not unlike what you were taught to expect of capitalism). You go along. The Harvard and IMF economists are possessed of the notion that the ruble keeps falling in value because neither the national budget nor the foreign trade account is balanced. (The same was true of the United States for decades, and our dollar remained embarrassingly strong, but let that pass.) The economists’ models convinced them that Russia required an austere tightening of the public belt that could be accomplished by downsizing the government, including the tax offices. As might have been expected, tax collections shrank further, just as they did in Nigeria and other emerging markets of the global village. The problem with the ruble is that only suckers now have much need of them. Almost everyone else takes care of taxes under the table-or simply disregards them altogether. Money is a funny thing. If no one has to pay taxes, it‘s not of much use for other purposes. There is no gold or anything else “behind” it, and it can hardly serve any practical purpose, even as wall decoration. The Federal Reserve bills I have in my pocket say on their face in small capitals, “This note is legal tender for all debts, public and private.” That means I can settle all debts I now owe by offering Federal Reserve notes to my creditors, including the government. It does not mean that anyone has to sell me something I want because I offer to pay in dollars. Storekeepers could demand cigarettes or Confederate currency or a bag of barley seeds (the money of account in some prehistoric societies), or they might just say no. It’s a free country. But if they have bills and taxes to pay-why else would anyone maintain a store? -they will need dollars. For my part, I need a good many dollars to settle things with the various tax collectors (Federal, state and local). And I don’t have much trouble getting rid of whatever dollars I have left, since the country is full of people willing to sell me things because they need dollars to pay taxes, and there are plenty of bureaucrats ready to see that they do. We’re all happy to work to earn dollars. We know that we will be able to use them to buy what we want as long as-but only as long as taxes are as certain as death. Russia recently announced that it would print rubles to help meet the government’s payroll and bills. Commentators in the American media have expressed horror at this use of the printing press. But the question is not how rubles are manufactured, it is whether enough taxes are levied and collected to ensure that there is a great demand for rubles by both individuals and businesses. As I’ve remarked before, the notes issued during our Revolution were “not worth a Continental” because the Continental Congress had no power to collect taxes. THE LESSON of our story is as promised at the beginning: A sound government is the sine qua non of a sound economy. Russia’s troubles are not primarily economic. Seven years ago its economic “fundamentals” were strong enough to scare us silly, as some of us are scared silly by China today. Its population was large and better educated than China’s. Its natural resources were greater. Its infrastructure was more highly developed. Russia had gone about as far as it could go peacefully, but it has a long way to go before its legal system can support a free economy. Our new slogan, greeted with cheers on both sides of the Congressional aisle, is “The era of big government is over.” Marx would have been delighted with it. The state, you will remember, was supposed to wither away. We have recently shown our allegiance to this slogan in at least four major ways. First, we led the way for NAFTA and GATT, both of which subordinate national sovereignty, human rights, and labor and environmental protection to commerce. Second, we extended most favored nation status to China on the fanciful ground that association with our business representatives would teach the Chinese not to torture or execute an untold number of political prisoners every year. Third, we are preparing to use our long-sought budget surplus, not to repair our torn social fabric, but to cut taxes, mainly for the well to-do. Fourth, it is not improbable that majorities in both houses of Congress could be whipped up in favor of abolishing or privatizing the Internal Revenue Service. us by the New Deal and World War II: (1) The New Deal gave us bank regulations and deposit insurance that have forestalled bank runs, and (2) World War II gave us our “big government”-24 per cent of GDP as opposed to the prewar 3 per cent-that provides a solid foundation of demand on which the supply side of the private economy can build with confidence, regardless of what happens in the rest of the world. 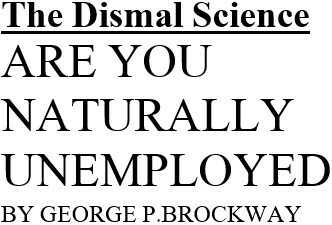 AT THE END Of my piece on “The Last Chapter in Keynes” (NL, June 29), I referred to the currently received doctrine of the natural rate of unemployment. The implications of the doctrine are such that they don’t, as the saying goes, bear thinking about. Nevertheless, I propose to try to think about them here and now. The expression “the natural rate of unemployment” was apparently coined by Milton Friedman in his presidential address to the American Economic Association on December 29, 1967. Friedman was clear that what he called the natural rate was not a natural law (like, say, S= 1/2[gt^2]). “On the contrary,” he said, “many of the market characteristics that determine its level [such as minimum wage laws] are man-made and policy-made.” Yet he saw and, I believe, still sees something inexorable in the idea. Friedman said he used the word “natural” because the idea was comparable to “the natural rate of interest,” a notion advanced by the Swedish economist Knut Wicksell in 1898. 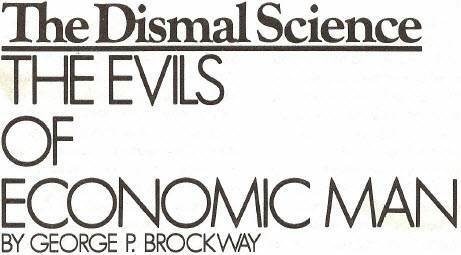 Wicksell is worth reading (though perhaps not on this issue), but for the moment we need note only that he is thought by many to have anticipated Keynes in some ways. And as to Keynes, we need remember particularly that his initial quarrel with the classic economists was that they believed involuntary unemployment was impossible. Since whatever is “natural” is ipso facto involuntary, Friedman, too, broke with the classics on this point. I hasten to insist that Friedman is not now and never has been a Keynesian or a neo-Keynesian, and certainly not a Post Keynesian (which, if you must know, is more or less what I am). The natural rate of unemployment is thus an idea that resonated unexpectedly in many corners of modern economic thought. In its pure form it goes like this: Given the civil laws, customs and institutions of the economy (though Friedman is not now and never has been an institutionalist follower of Thorstein Veblen or John R. Commons), beyond a certain point any increase in the rate of unemployment will result in deflation and a recession that will continue until wages fall to a level to encourage entrepreneurs to start hiring again; on the other hand, any decrease in unemployment will result in inflation and a recession that will continue until employment returns to its natural rate. The idea was not immediately embraced by the profession. 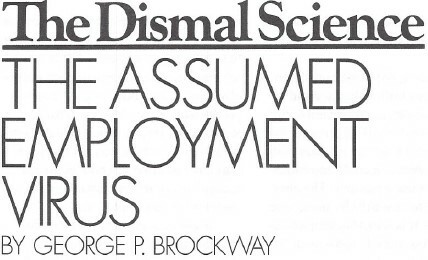 Very likely thin-skinned economists were timid about saying that joblessness could be your patriotic duty. This difficulty was overcome when somebody (I’m sorry I don’t know who) came up with a name that obscures the implications of the idea and has, moreover, an acronym that soothingly sounds like the name of a languorous South Sea isle. The new name is Non Accelerating Inflationary Rate of Unemployment, or NAIRU. The modifier “nonaccelerating” is a modifier of Friedman’s original notion and recognizes the fact that, as we know from our experience of the past half century, it is not too difficult to live with inflation if the rate is fairly low and steady. The NAIRU was 3 or 4 per cent at the end of World War II. It reached 5 or 6 per cent in 1975, after the Federal Reserve Board raised interest rates in its quixotic response to the first OPEC embargo. And it appears to be around 5 or 6 per cent today (the current 7.7 per cent rate of unemployment is dismal from any point of view). Let us be sure we understand what a NAIRU of 5 or 6 per cent means. It means that, given our present labor force of some 127 million men and women, about 7 million of them must be unemployed through no fault of their own. Forgive me for raising my voice, but we must see clearly that NAIRU won’t work if unemployment is the result of stupidity, poor training, laziness, lawlessness, or unreasonably high wage demands – if unemployment is, as the classical economists said, voluntary. The NAIRU people are not the people of Reaganesque anecdotes (if such people there ever were) who flit from job to unemployment insurance to job as spirit moves them. 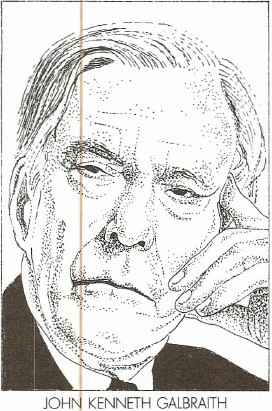 Stupid, incompetent, lazy, lawless, or grasping people do not compete for existing jobs; it is the function of NAIRU people to make holders of existing jobs fear for their positions and so acquiesce in low pay, unsafe or Quayle-approved working conditions, frayed fringe benefits, and nonunion shops. Perhaps you will now sense another resonance of the natural rate of unemployment. It is the stern, impassioned tread of Karl Marx’ industrial reserve army. “The industrial reserve army,” Marx wrote, “during periods of stagnation and average prosperity, weighs down the active labor-army; during periods of overproduction and paroxysm, it holds its pretensions in check.” Friedman might have put it somewhat more gracefully, but he couldn’t agree with it more. How did the soldiers of the industrial reserve army get recruited? They weren’t rounded up by press gangs like those that helped Britannia rule the waves, but their fate has not been dissimilar. They did not volunteer, and they were not drafted; they were in the wrong place at the wrong time, and many of them were simply born wrong, just as Rockefellers and such happened to be born right. They are victims of crashingly bad luck. From time to time, demographers publish studies averring that only a percentage (say 10 per cent or 5 per cent or perhaps 1 per cent) are what we used to call lifers and spend their entire lives in the industrial reserve army, or that only some other percentage (say 12 per cent) serves more than 27 weeks at a time, while Horatio Alger and his like are discharged in a matter of days. We may accept these studies, or most of them, at their face value and still observe that those in the industrial reserve army serve as a consequence of crashingly bad luck, and that they serve in our interest and indeed in our stead. This being the case, it cannot be denied that our economic system – a system said to depend on the natural rate of unemployment – would self-destruct if it were not fundamentally unjust. It is clever to say that life is unfair; it is corrupt to raise unfairness to a principle of control. As we noted here a short while ago (“Where Schumpeter Went [Astray],” NL, April 6), Joseph Schumpeter celebrated capitalism as “the civilization of inequality and the family fortune.” I cannot do that. I cannot understand doing that. I cannot settle for NAIRU in any of its forms. I can accept the military draft and have in fact been drafted. It is possible in time of war to show citizens, chosen by lot, their duty to risk their lives in defense of the nation that nurtured them. It is not possible to show anyone a duty to lead a life of squalor in order that others may be free to choose among moderately priced commodities. If there really is a natural rate of unemployment for our system, the system is immoral. If it is immoral, we should change it. Some will say that even with NAIRU, ours is the best system seen so far, and others will say that NAIRU applies to all systems. Despite these answers, improvements are possible. To share the burden of NAIRU fairly, we might take Marx’ metaphor literally and institute a draft for the industrial reserve army. It is unlikely that there would be volunteers, and there should be no exemptions of any kind (except for the unemployable). Membership in the army probably would be by nuclear families, unless children were put out for adoption while their parents served. There would no doubt be problems with the definition of a family, but I’m sure that, given good will, solutions could be found. Every able-bodied family in the nation would pull at least one hitch in the army. Service would consist of living without personal assets or income (including imputed income, as for example, decent food, clothing, and shelter) for a period. I imagine two or three years would suffice at the present natural rate of unemployment. For ease of administration, it might be convenient in some cases for families to exchange homes. Certainly the houses of wealthy draftees could not be left vacant without inflating the general cost of housing. Private charity also would have to be rigorously controlled to prevent favoritism and corruption. Food Stamps, Aid to Families with Dependent Children, Medicaid, and the like (including Workfare if finally enacted) would be available. Of course, for the army to serve its purpose, recruits must be able to work, but their availability would have to be in accordance with length of service. It wouldn’t be fair for me to be enlisted one day and hired by a friend the next. Perhaps all that strikes you as preposterous. I hope so. It certainly seems preposterous to me. But the whole idea of placidly accepting a natural rate of unemployment strikes me as far more preposterous. Now, looking back at the theory of NAIRU, we note that the general price level is to be controlled by holding down only one of the factors of production (labor). Why shouldn’t we also hold down the rate of interest? Since inflation of the costs of production is the issue, why shouldn’t we have NAIRI as well as NAIRU? “But,” cry the governors of the Federal Reserve Board, “we already control inflation by raising the interest rate.” They know not what they do. In the 40 years since 1951, when the Reserve freed itself from its wartime agreement with the Treasury to hold rates down, the percentage of GNP that goes to pay interest on debt of the nonfinancial sector has gone from 4.59 per cent to 20.51 per cent. Let me put it another way: In 1951 the interest bill of American corporations was about one-twelfth of their wage bill, whereas today it is more than a third. If the 1951 ratio still applied, today’s costs would be roughly $845 billion less than they actually are, and the price level would be lower by a considerably greater amount. By raising the interest rate (even now it is more than double what it was in 1951), the Federal Reserve Board has contributed to (if not mainly caused) inflation. It has then restrained the inflation it caused by bringing on recession, which keeps the industrial reserve army in being. So NAIRU not only serves reactionary interests in keeping wages in check; it is a convenient reactionary ploy in other situations. Public works cannot be used to reinvigorate the economy because the increase in employment would violate NAIRU. Likewise, although doctrinaire free traders may admit that selective protection might protect or restore as many as 2 million jobs, NAIRU forbids it. And so on. 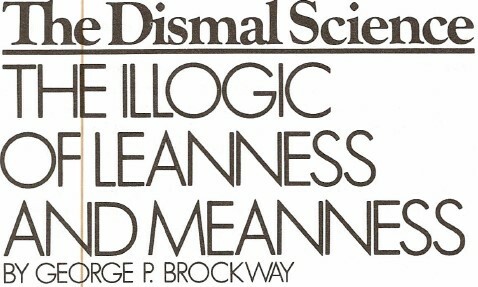 In short, the nasty theory of a natural rate of unemployment is counterproductive as well as immoral.